The PA4000 is a full-featured siren amplifier system with a remote control head that can be flush mounted to any flat surface. 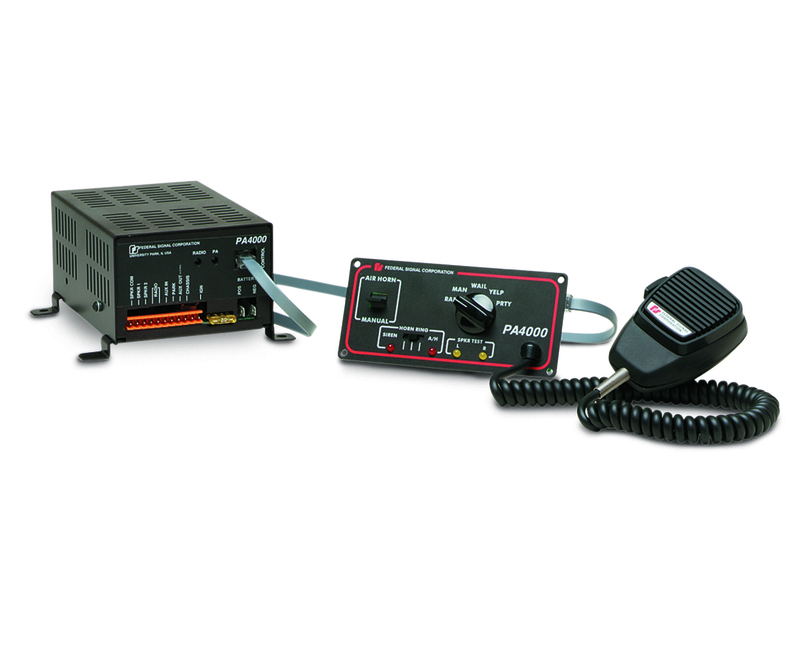 The design of the PA4000 siren system is ideal for use in ambulances, police cars, fire apparatus and command vehicles. Continuing the Federal Signal unmatched tradition of quality, the PA4000 incorporates the latest technology for superior reliability. This 200-Watt siren is engineered to meet Class A specifications and can drive two high-powered 100-Watt speakers. Designed for easy installation, the PA4000 consists of an amplifier unit, flush mount control head, and RJ-45 wire to connect the two components. The PA4000 has a unique diagnostic feature that checks for abnormal operation of the speaker system. Two LEDs light up to indicate speaker operation during test mode. The siren emits an intermittent low-level sound that is picked up through the speakers and causes the LEDs to flash when the sound is successfully transmitted. The PA4000 includes an AUX/IN feature that will place the siren in Wail mode when in Manual. The AUX/OUT feature drives an external relay that may be used to control warning lights. The AIR HORN/SIREN feature is activated using a paddle switch on the control panel. Also included is HORN RING controlled by a slide-switch and TAP II, which enables the driver to change the active siren tone via the vehicles horn ring.